Join us for our Summer Book Study Day as we discuss the non-fiction work God Is: My Search For Faith in a Secular World by David Adams Richards, an acclaimed Canadian author of novels, short stories, memoirs, essays, poetry and plays. 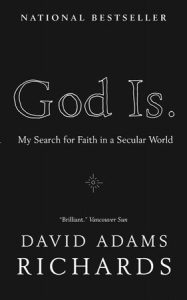 “In this invaluable contribution to the continuing debate about religious belief, David Adams Richards offers an exhilaratingly fresh perspective and a voice more impassioned, heartfelt, and sometimes furious, than anything written about God by an atheist. David Adams Richards, one of Canada’s most beloved and celebrated authors, has been wrestling with questions of morality, faith, and religion ever since he was a child. They have always informed his fiction. Now he examines their role in his own life and spells out his own belief, in what is his most self-revealing work to date. With characteristic honesty, Richards charts his rocky relationship with his cradle Catholicism, his battles with personal demons, his encounters with men who were proud to be murderers, and the many times in his life when he has been witness to what he unapologetically calls miracles. In this subtly argued, highly personal polemic, David Adams Richards insists that the presence of God cannot be denied, and that many of those who espouse atheism also know that presence, though they would not admit it to anyone — including themselves. Every follower of today’s battle between faith and atheism, and every lover of David Adams Richards’ superb fiction, will find God Is revelatory.” From the publisher’s Web site.